The event of the SUMMER is HERE! 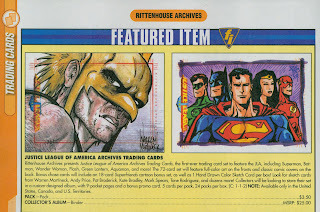 In July, the JLA/ Rittenhouse Archives' Card Sets drop, and you will finally be able to buy, sell, and trade exclusive hand drawn, original Sketch Cards by dozens of artists, including myself, Corey Breen. Search high and low for my cards, and cards by my coworkers, all of whom are amazing artists! Steve Wands, Dezi Sienty, Michael Sellers, Thomas Valente, Harvey Richards, and Fredrick Haynes all contribute to this amazing set! Be one of the lucky ones to get an ORIGINAL, FULL COLOR CARD! 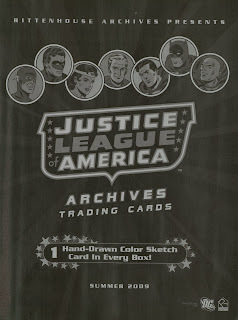 All of us were lucky enough to do 200-250 sketch cards, along with other professional artists around the world! I hope that in July, you will try and pick up some of the cards, and hopefully, you'll get one drawn by me! I hope to have more info as the release date gets closer, as I will definitely be posting most of my cards on this blog! That way you can see what they look like, even if you don't collect them and chase them down in stories! I also get to have five cards that I am allowed to sell straight up, so maybe you would be interested in getting one of those from me personally if you can't seem to get one the old fashioned way! My coworkers and I are very excited about the release of the set, and very proud of the work we put into the cards. We can't wait to show everyone, and closer to the release date, once we get the a-ok, we will do so. Keep a look at right here, and I'll be sure to let everyone know when that is! Pass the good word, and be ready come JULY! Since I still do not want to share my Green Lantern Spread (soon, I promise), I wanted to make sure everyone got a chance to see my House of Mystery Sample Splash Pages I did not too long ago! 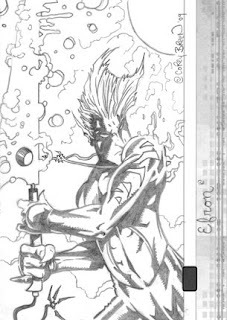 I thought since I had a previous post about one of my favorite Vertigo series about how I had done some art corrections on the book, I wanted to show some of my original artwork and how I would portray one of the best characters in that series, Cain. Cain has been around for a long, long time. If you are reading the current series, and like it, I have to suggest you go out right now and purchase the House of Mystery Showcase Volumes! It reprints all the old, classic tales from the late 60's, early 70's. There is some GREAT stuff there, and some amazing artwork too, especially most of the art by Bernie Wrightson and Neal Adams! One of my favorite stories is in Volume 1, issue #186, called The Secret of the Egyptian Cat, followed right after by a story called Nightmare. the artwork above is my take on those two stories, with Cain (the storyteller of the House) and the Faun, and this Igor-like character that was drawn originally by Serio Aragones. If you are in search of some great fables, look no further then the old and now new House of Mystery tales! 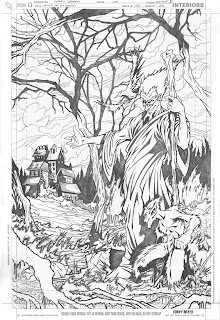 Be on the lookout for the latest issues of the new series, House of Mystery #13, where you will see some brand new art by the old masters from this series, in Neal Adams, and Sergio Aragones! Hope you like the images, especially if you haven't seen them yet on my main site, www.cjbpro.com! I did these as samples to show the editor some of my work. It would be so cool to one day do something like a back-up tale or short story in the new series, since they always have guest artists come in and draw some pages. I was hoping with something like these two images, I'd start to get my foot in the door on that. Anyway, Check back soon on this very blog for more new stuff soon, and hopefully I'll finally post my JLA/ Rittenhouse Cards and also the Green Lantern Spread. Or should I hold off on that til the debut of Blackest Night next month, just for the hell of it?! For Christmas this past year, I got the book and the video game, Star Wars Unleashed. Much like Shadows of the Empire, this was a multi-media release of a story set within the Star Wars chronology. The book was based on the game, and tells the story of Darth Vader's secret apprentice, named Starkiller. It takes place after the Clone Wars and order 66 after Revenge of the Sith movie. In it, Vader is hunting down the Jedi that fell through the cracks, and upon killing one of them, realized he now orphaned a small child strong in the force. Instead of killing the child like he did the Younglings in Revenge, he decided to take on this child as his apprentice, hidden from the Emperor. Now, I have to say, I love ALL things Star Wars, and try to read as many expanded universe things, because I usually enjoy all of it. My favorite being the Heir to the Empire Trilogy, and the Hand of Thrawn books by Timothy Zahn. But this book, upon reading it, was just plain AWFUL! It's made me go off on a complete nerd rant, and I thought I would share why. First of all, the main character in this book is named Starkiller. Starkiller?! Come on, that is the WORST name ever. My favorite character is called Luke Skywalker in Star Wars, so why name this idiot Starkiller? So contrived. Second, why in the world would Darth Vader take on a SECRET apprentice? It makes no sense, because there is the rule of two with the Sith, and Vader just went through all the prequels to become the Emperor's second, so why take on a third? He is Darth Vader, he doesn't need a secret assassin. He can do the job himself. The book sets it up so he can use Starkiller to hunt down Jedi and kill them for him, so he doesn't have to. Would he think for a second that this would not work out? Oh well. Anyway... turns out, he betrays the apprentice after he tells him he wants to take out the emperor and take over the galaxy with him. He betrays him because the Emperor finds out about Starkiller. This is fine, whatever, since there is 200 more pages in the book, we know he lives. So in secret again, pretends to join the newly forming rebel alliance under Vader. But turns out in the end Vader and the Emperor used him to get the new alliance out in the open to crush it. They kidnap Bail Organa and Mon Mothma, and others and take them to the under construction Death Star. But struggling with the dark side, Starkiller tries to save them. THIS IS WHERE THE AWFULNESS REALLY MAKES ME MAD! He proceeds to kick the CRAP out of Vader, AND the Emperor! WHAT?! Come on! No WAY! It's bad enough that Vader has this "son" that he raised to try and take over the galaxy (hello- that's the whole point of Luke Skywalker later on- why do the same story, and lessen the point of his REAL son??). UGH. So this loser is stronger then the both Vader and the Emperor? No way! Then, he saves the alliance, and they flee, but not before he sacrifices himself in doing so by throwing himself in front of the Emperor's Sith lightning. Stupid death scene. Could have been better if it was Vader, since this book just made Vader a weakling, where Vader should have been, "look kid, you have failed me, I will destroy you," and put a lightsaber though his chest. UGH! Then it ends with the alliance honoring this tool, and they use his family crest as the freakin' symbol of the Rebel Alliance. WHAT? So dumb. Well, that's my rant. I will play the video game. Maybe that will at least be more fun then the book. But I am not counting this stupid series as in Star Wars continuity. It was a complete failure, especially compared to the AMAZING Shadows of the Empire, which besides the Dash character, completely worked within the time period it took place. I think that was the problem with this. It tried to create a story and jam it into the history. Shadows just filled in the gaps that were missing. Worked much better. 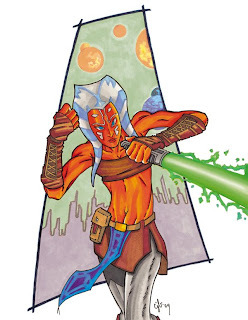 So, now you say, why did I draw Ahsoka, from the Clone Wars cartoon? 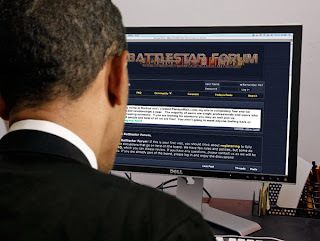 Well, if you got this far in this post, there is a reason. Unlike Stupidkille-- I mean, Starkiller, I actually like Ahsoka. At first I hated the idea of Anakin having an apprentice. For much the same reason as Darth Vader not needing one, it seems forced. But the cartoon has been amazing in it's first season, and she has grown on me. I still think she needs to die a horrible death, and that will make it just one more reason that Anakin starts turning to the dark side. He never experiences a huge death of someone close to him, and this could be that person. Usually, the downfall of people reaching rock bottom is the death of someone they love. Ahsoka could be that person. And you can explain her not being mentioned ever again (one of the problems of characters like her and Starkiller), is that her death hurt so much, he told people NEVER to talk about her. It could be a complete denial thing, and something that is a painful inner psychological issue. Makes sense, right? Doubt they will do that but, I can hope, right? We'll see what happens to her, because something has to, because obviously, she is not in Revenge of the Sith. The drawing above was done in pencil, pen & ink, colored in Prisma Color Markers, and touched up in Photoshop. Hope you like it. You know... I just realized that the position of the arm is similar to the Snake-Eyes drawing I had done last week. That was by total accident. Oh well, just goes to show you how hard it is to come up with new positions to draw super-heroes in. 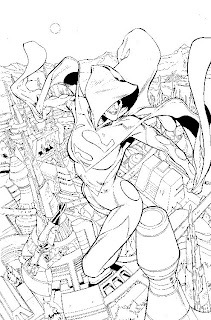 Below is the original inks and pencils. PS- I am still working on the HUGE Green Lantern Double-Page Spread! It looks amazing. 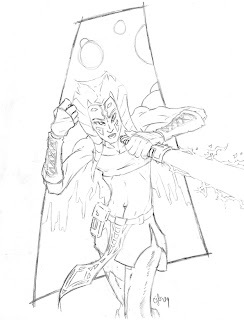 I have finished the complete layouts, and now am working of finishing the pencils. It's gonna take a little while though. It has 35 characters. This is one of my biggest attempts at doing what someone like Ivan Reis and George Perez have done, fitting a TON of characters on one or two pages. I want to make it as good as I can. I'll keep you updated on it, and will post it as soon as I am done. 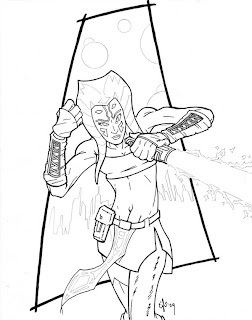 It's the reason why there was no new drawings or Blog posts until I took a break from it to draw this Ahsoka piece. So if you don't hear from me for a little while again, this spread is probably why. But I'll try to post stuff in-between finishing it, must like I did today. Time to read Satr War: Outcast, too. God I hope this book is better then the Force Unleashed. UPDATED - My biggest critic, my Fiance, Kristy, made me tweak a lot of the background colors because she didn't like them before. She said it was all clashing together, and you couldn't see the figure. I didn't agree, til I tried some color changes, and once again, she was right! Thanks Kris! Going back a couple of months, I thought I'd show you a correction I did on a recent issue of Supergirl. 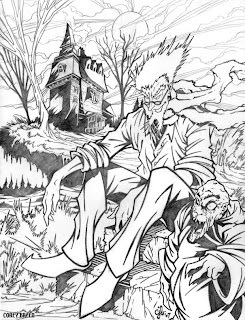 Above is the original page drawn by Jamal Igle and inked by Keith Champagne. Since this was the introduction of the NEW Superwoman, this was a very important page of the book and the Superman Universe in general. The only problem was that Jamal had drawn in another Kryptonian character on the page. 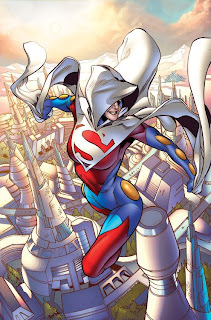 The editor wanted that character removed, so that only Superwoman was featured; for this was the big reveal, after all! So, it was my job to remove the extra flying figure in the lower left hand corner, and finish all the art and buildings that were now missing from the art. Once I took out the figure in Photoshop (erasing and selecting around him), I had to zoom in real close, and carefully redraw the buildings where he used to be. I did it all digitally on my Wacom tablet, just using the pen freehand. The final corrected art that was sent to the colorist is below. Hopefully I did my job well enough where you can't tell that there was ever a figure drawn there originally! Like I said before, my job is to match the style of the freelance artists so that you never know that anything was ever changed, if changes are needed. When there is an art correction, I must make it seem that thats what the original artist had drawn. So how did I do? It should look like that figure originally drawn had never even existed. WHOOSH, it's gone... MAGIC! The redrawn buildings is all that is there now! Bet you never knew that this page originally had a another character on it! The now corrected art file is sent to the colorist, in this case the amazingly talented Nei Ruffino, to be colored in Photoshop. This completes the final image as seen in every issue of Supergirl #35! PS- House of Mystery #12, with some of my art corrections seen here on my Blog, out TODAY! Check it out! GREAT story and AMAZING art! Above is a character I designed. It was gonna be for Zuda Comics' launch, hence the card it was drawn on. But I did a Batman one that I sent it instead that was posted on their site a while back. Didn't want to give Zuda a character I created on my own. Anyway, this is a character I named Efron, who is an elf of sorts, and I kind of dig him. He looks cool with his Final Fantasy-esqe water-sword. I have a TON of creator owned characters and ideas that I'm always working on, but never seem to have the time to just create them. I always start by trying to create a "bible" for the ideas and design a book like it was a video game. But I always seem to only get so far, and then move on to another idea, drawing, or project. My attention span is way too wavering sometimes. I need to just focus on one idea, one book, one character, and sit my a$ down and create it. I hope to do that with SaricH, and just write, and draw it, and stop procrastinating. I have the idea, the plot, and a bunch of designs for characters, so it's just a matter of doing it. I'm hoping working on the sculpture will help get into doing the book. If I do a book, I can just print it myself as a graphic novel someday or something (obviously after I don't work at DC anymore). But I need to start now. Just focus on SaricH and try to get a book written and drawn. I know I can do it, I just need to start. Much like everything else in my life, once I start something, I have to see it through til the end. So I know if I start a book of my own, I wont stop until I finish it. If it takes five months or five years, I will do this. I wanna follow in the footsteps of one of my comic idols, Dave Sim. If I can have something like the first volume of Cerebus or something, then I will be beyond happy with myself. I just need to stop being so "lazy" with my creator owned projects. 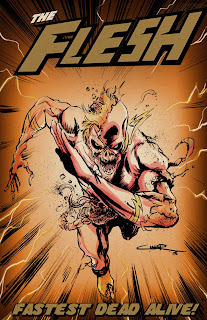 Below is some art by Brett Booth that I found from his deviant art site (link found in my links on this page or at http://demonpuppy.blogspot.com/). I really LOVE these drawings. They are so AWESOME! Brett gets a bad rap from a lot of people, and I think it's a little unfair. Yes, he has a very stiff style sometimes, but when he creates characters like this, I think he is AMAZING! 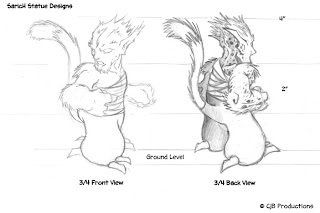 I absolutely LOVE anamorphic characters, and I hope to create some just like these below for any book I do. Thanks for the inspiration Brett! Awesome Designs! Make me want to just create characters for a living, like a lead character designer for a video game or movie ( my DREAM job). It may be too late for me to do that, but if I can use inspiration like this and put it to good use, I'll be content. Enjoy! It didn't work out so well. I did some nice things with it, but the Sculpey I used was not the right material I thought it was. This was like kid's Sculpey or something. It was too malleable and soft. I couldn't keep any shapes down, and there was too much volume. I was adding too much clay to the piece, and it wasn't what I remember using in college when I tried to make an action figure. The Sculpey I remember was pink, and was a lot more easier to work with. And without the wire frame, I had nothing to go by, and the figure turned out five sizes too big. When I put him in the oven to dry, he kind of sagged too. So my first attempt at this failed, as you can see above. Oh well... back to the drawing board, literally. This time I am determined to do it right. I did the new designs, I went to the art store, and got all the materials I remember. I got wires, tools, the Sculpey I remember. I also got some helpful hints from my buddy, Amos (who is an amazing sculptor... check out his link below)! I'm ready to try to make that image of SaricH that you always see associated with me; a professional, cool-as-hell looking statue. I want something I can bring with me to conventions, and have on my desk, and be proud of. I have a lot of work to do. I'm not a sculptor by any means, so I'm gonna have to really cross my fingers and see if I can gather up all my artistic strengths and make this a reality. If not, I will pay Amos to make it, and I KNOW that it will be amazing, and exactly what I want. But I'm gonna give it a go again myself, see what I can do. Wish me luck! Tune in tomorrow for more art! Turns out I have a LOT to show and tell this week after all! 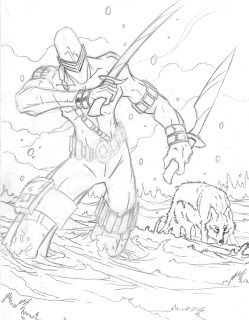 More GI Joe, more "What I do at DC", and more creator owned characters! It goes without saying that I am really, really nervous and yet very excited for the movie. Some things I have seen look cool. Some things I have seen look beyond awful (cough, cough Cobra Commander, cough). I just hope that the movie treats the franchise with respect. And by respect, I mean, stay true to the essence of the original content. The TV show, although silly, treated it like it was real. The comic book, even more so. All I'm asking is that the movie portrays the characters as they should be... as creator Larry Hama made them. Obviously, Snake-Eyes is my all time favorite character. Even more so then Batman, and Spider-Man. I'm not kidding. 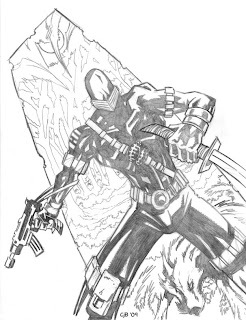 How could you NOT love Snake-Eyes?! He is a mute ninja. He doesn't need words! 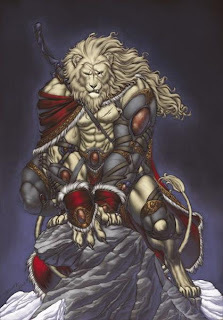 He needs two swords and a WOLF! (Growing up I wish I could meet a wolf and be friends with him and he would go where ever I went. I had my dog Rusty, but he was far from a wolf.) 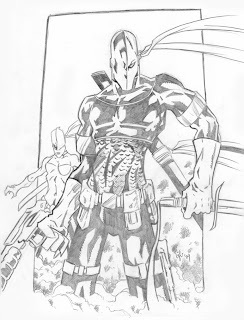 Snake-Eyes is one of the BEST, if not the coolest characters ever created. 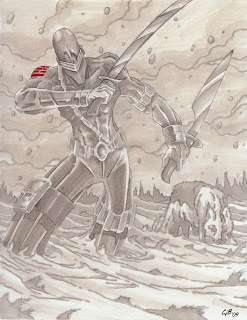 Above and below you will see my Snake-Eyes pin-up. Above is in pencil, and toned-up in my Letraset Tria Marker Set (12 Pantone colour markers - cool gray). Below is the initial pencil drawing. Let me tell you though, Snake-Eyes is NOT easy to draw. I've been working on this piece for about 3-4 days now. Props to Mike Zeck, Andrew Wildman and J. Scott Campbell for drawing kick-a$$ pics of him in the past, that was my influence! Hope you like the piece. Before I go, I had to share some things I came across this week while reading some comics and surfin' some internet. The first comes from the AWESOME Robert Kirkman of Invincible and Walking Dead. This is a page from the Brit comic that he co-wrote, and it's a comic page that I just had to share. 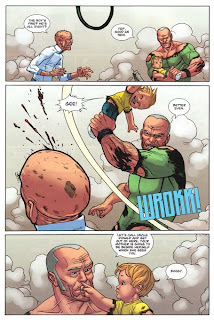 It's not everyday you see a superhero grab his baby boy by the legs and smack down a super-villain with him. Panel two of Brit #12 must go down in comic book history as one of the best panels I've ever seen. HILARIOUS! Enjoy! Another cool tidbit I want to pass along. Below is an image from the DCU Blog. That's right... DC Comics finally got their OWN Blog! Yes, finally, DC can reveal exclusive content and news through their own site. It's about time, I'll say, and great work by Alex Segura, Ian Sattler, and everyone else involved! I totally have it at the top of my bookmarks now, and I hope everyone puts it on theirs. Some awesome Blackest Night teasers there right now, so check it out! Last but not least is one on my favorite sites on the internet... the funny folks at the Onion News! They recently ran this story as to why Barack Obama is depressed, and I think they are RIGHT on! Frakkin' A! Enjoy! I have a ton of family obligations this weekend, so I don't think I'll have much of anything to post by early next week. I could try to post the designs I have done for my statue of SaricH © that I am in the process of making. I am trying to sculpt one of my creator owned characters named SaricH © (actually, the little Leopard Cub from my 1st post, if you scroll down). I tried one attempt, but the clay was too soft, and I tried to do it without a wire frame, and it was just too big and clunky and not what I wanted. So I'm gonna try again with better Sculpty, and more experience. 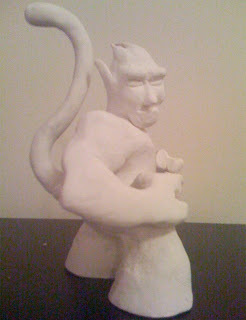 (If I can't do a great sculpture, I'm gonna hire my amazing sculpture friend, Famos Amos!) But, I did do these design drawings (a full 360 turn type deal), so maybe I'll post those on Monday.